Can we ever really be plastic-free??? 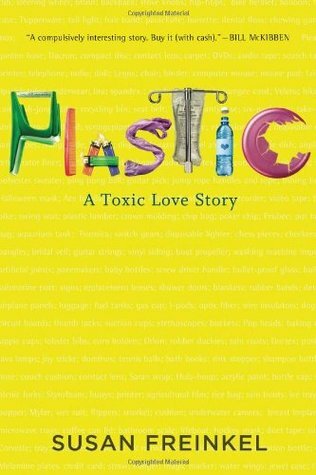 I recently read the book “Plastic: A Toxic Love Story” by Susan Frienkel. Overall I would give it a 3 out of 5. Here are some thoughts/quotes from the book. She hooks me immediately with an experiment – not touching anything plastic for an entire day. She realizes that she is unable to use the toilet since the seat is made of plastic. What ever is she to do??? She decides to change to documenting the items she touches during the day. I don’t know about you, but I would have thought a little more about it before I started my experiment OR this is just a creative hook. As I thought about my “day”, even my flooring is “plastic” and I would have to stay in bed all day! It is interesting to be forced into the realization that so much of our everyday life is plastic. Building supplies, transportation, etc. She spends too much time on the history of plastics and their manufacture for my liking. One study she mentions looked at the effect on organisms in the Great Lakes region by Colburn. It basically found that adult organisms were OK with the toxins but their offspring were not. Reproductive/developmental/growth issues were becoming more common and extreme. Even if we go plastic-free, the toxins from the manufacturing processes are and will be released into the environment. Big question should be – how do we reduce this?? A study by the Environmental Working Group found an average of 200 industrial chemicals and pollutants in the umbilical cords of newborns (pg 103) What effects will we see long-term in the offspring?? Learning disabilities? reproductive failure? autoimmune disorders? Many plastics were made for durability for military uses. After WWII, plastic companies needed to continue to sell these items. Now we have styrofoam containers when this plastic was originally made for life rafts. Ads generated a new consumable/disposable life for objects. Why clean something you can just toss?? We now see the same thing but with “eco” twists. “Use this and be environmental.” Many don’t think about the object once it hits the trash bin. 1970 the average American generated 3.25 pounds of trash with 3.0 pounds going to landfill (92%). In 2008, the average American generated 4.5 pounds of trash with 2.4 pounds going to landfill (53%) pg 194 Yes we send a smaller percent to landfills but 3.5 to 2.4 pounds isn’t really that great of an accomplishment. We are consuming more and recycling hasn’t increased much in 40 years. As I sit in my plastic armed chair, looking at a plastic covered monitor, typing on a plastic keyboard, one needs to ask – how easy it will be to remove plastic from your life? At what level are you willing to be plastic-free?? This morning I was laying still at the hospital during my tests in radiology. I had a few random thoughts about plastic based on a my observations and inability to move for 40 minutes. The hospital uses a lot of plastic and nothing seems to be recycled. how much of the plastic chemicals were leached from the tubing and syringe before injection into my body?? shouldn’t the medical industry figure out a way to repurpose/recycle some of these “disposable” items?? Are they worried about disease transmission if they recycle? If I remember correctly, to “melt” the plastics requires a much higher temperature than anything could live. The scanning machine was basically all plastic. I’m sure there was some metal in there somewhere but I couldn’t see it. The plastic beverage cup I purchased to wash down the cookies was plastic. Not sure which annoyed me more – being told to eat cookies for breakfast or having to pay for a beverage to go with it. There wasn’t a drinking fountain anywhere to be seen! Did drinking fountains become obsolete in public? I have many at my work site, but rarely look for them elsewhere. Have the hospitals eliminated them to prevent the spread of diseases?? My required water just before the test was in a large (maybe 32 oz) styrofoam. They filled it about a quarter of the way up. I just added it to the iced tea I purchased at the coffee corner. I thought styrofoam was worse than other plastics – guess I need to do some research. Papers – now here is the irony! They had me read the required warnings in a plastic wrapped paper. So they won’t give me a copy for “environmental” reasons but they don’t recycle the plastics??? Does it really need to be connected to the Internet?? She seems to hit certain dilemmas in our minimalist/simplification/environmentally-friendly quest right on the head. We often comment about some of the same things she mentions in her article.